BACKGROUND: In 2004, the US Department of Veterans Affairs expanded its delivery of chiropractic care by establishing onsite chiropractic clinics at select facilities across the country. Systematic information regarding the planning and implementation of these clinics and describing their features and performance is lacking. OBJECTIVES: To document the planning, implementation, key features and performance of VA chiropractic clinics, and to identify variations and their underlying causes and key consequences as well as their implications for policy, practice, and research on the introduction of new clinical services into integrated health care delivery systems. RESEARCH DESIGN, METHODS, AND SUBJECTS: Comparative case study of 7 clinics involving site visit-based and telephone-based interviews with 118 key stakeholders, including VA clinicians, clinical leaders and administrative staff, and selected external stakeholders, as well as reviews of key documents and administrative data on clinic performance and service delivery. Interviews were recorded, transcribed, and analyzed using a mixed inductive (exploratory) and deductive approach. 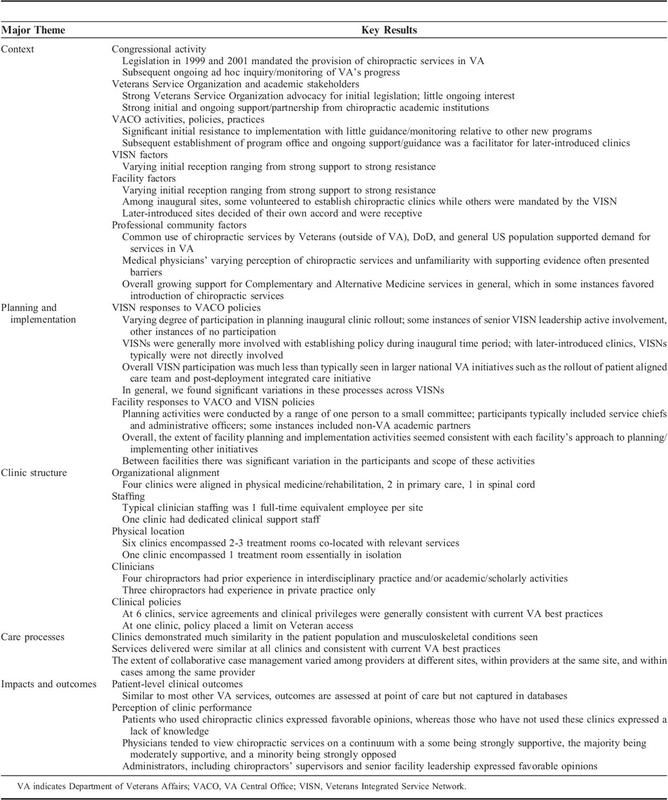 RESULTS AND CONCLUSIONS: Interview data revealed considerable variations in clinic planning and implementation processes and clinic features, as well as perceptions of clinic performance and quality. Administrative data showed high variation in patterns of clinic patient care volume over time. A facility's initial willingness to establish a chiropractic clinic, along with a higher degree of perceived evidence-based and collegial attributes of the facility chiropractor, emerged as key factors associated with higher and more consistent delivery of chiropractic services and higher perceived quality of those services. Nevertheless, before 1999 it was not common for the Department of Veterans Affairs (VA) to provide chiropractic services to Veterans. Congressional authorizations in 1999 and 2001 resulted in the addition of chiropractic care to VA’s standard medical benefits, making it available to all eligible Veterans (Pub. L. 106–111; Pub. L. 107–135). In 2004, VA established the policy that a minimum of 1 health care facility in each of its 21 geographic service regions would provide chiropractic services onsite; the remaining facilities would provide these services either onsite or by referring patients off-site to non-VA doctors of chiropractic (DC). [14, 15] An inaugural group of 26 VA facilities was selected, and by the end of 2005 each had established an onsite chiropractic clinic. The planning of these clinics and development of operational parameters were largely determined by each local facility with minimal coordination from Veterans Affairs Central Office (VACO). Subsequently VA established a national office to oversee the program, and has added 2–3 new clinics per year. By July 2014, a total of 51 VA health care facilities provided onsite chiropractic services. Understanding the features of VA chiropractic clinics, the varying aspects of their introduction, and their integration into local health care facilities is an important step toward assessing and maximizing the quality of care delivered. Studying the introduction of chiropractic services in VA furthermore provides guidance for studying the addition of other new clinical services into VA and other health care systems. characteristics, and selected impacts and consequences of these differences. At study commencement, 41 VA facilities had established on-station chiropractic clinics, and after excluding clinics affiliated with the study team, independent outpatient clinics, and clinics temporarily closed due to staffing turnover, a group of 36 sites was eligible for recruitment. We set a sample size of 7 clinics, including 1 pilot site, to obtain data from a broad cross section of existing clinics. Clinics were invited following a sampling algorithm based on the above-mentioned characteristics. and VA back pain patients both who did and did not receive chiropractic care. We also interviewed representatives from VA’s initial chiropractic advisory committee, Veteran Service Organizations, and chiropractic academic affiliates. Interview guides were developed for each stakeholder type through an iterative process involving all investigators and guided by an a priori conceptual framework based on Donabedian’s structure-process-outcome model for quality of health care. Interview questions addressed subjects’ knowledge, attitudes and behaviors relative to chiropractic services, and key features of the national and regional context, the clinic planning and implementation process, clinic characteristics, and clinic performance and impacts. Subjects were invited by email, telephone, and/or in-person at the time of site visits. Interviews were transcribed and analyzed following a directed content analysis approach using thematic codes developed consistent with a priori hypotheses based on prior literature and VA managerial data, as well as new themes emerging from ongoing transcript review. Interview transcripts and policy documents were coded and analyzed using NVivo (QSR International) and Microsoft Excel (Microsoft), respectively. Quantitative data on clinic use, conditions seen, and services delivered were obtained from VA administrative databases, and these data were analyzed with descriptive statistics. We invited 12 VA facilities to reach our target of 7 participating sites. Of those that declined, 3 stated their decision was due to perceived interference with clinic workload or other time conflicts, and 2 opined that their site would be engaged in the research, thus requiring a local PI and IRB approval. 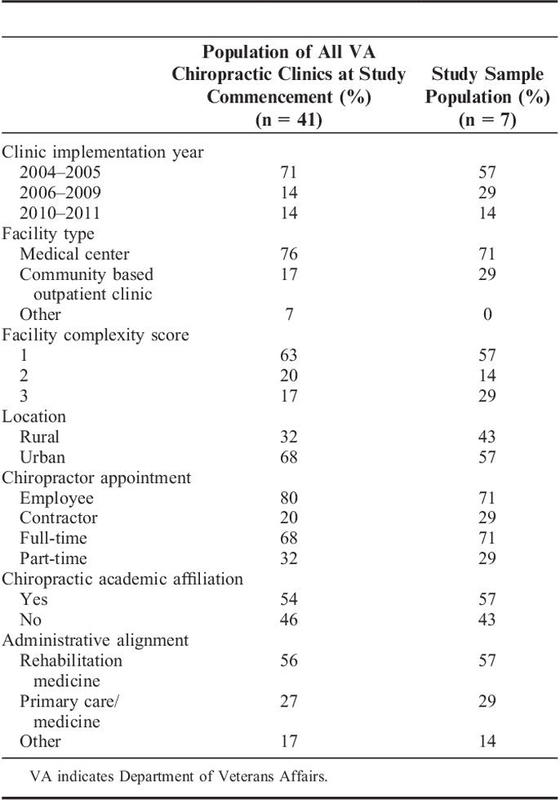 The group of 7 study sites was similar to the overall population of existing VA chiropractic clinics in terms of all clinic sampling characteristics (Table 1). Our interview strategy aimed for 15–18 subjects at each facility, for a total range of 105–126 subjects. To reach that number, we invited 255 facility stakeholders to be interviewed and 114 (46%) participated. from the given stakeholder group. We obtained and analyzed 75 policy and procedure documents. High interrater agreement (κ=0.8) among coders was demonstrated on a randomly selected subset of 20% of transcripts. A preliminary conceptual model was developed to frame our inquiry and data analysis. This was refined via an iterative process as themes emerged from the site visits and subsequent transcript review. The final model composed of 5 main elements, and results for key subthemes, is presented in Table 2. In response to the 2001 legislation, VA convened a Federal Advisory Committee to develop recommendations on the introduction of chiropractic services. In light of the relative lack of strong examples, models or precedents for adding chiropractic services to a large integrated health care system, VA’s subsequent Directive mandating establishment of a chiropractic program allowed for a broad range of clinical arrangements, facilitating experimentation and variation at the facility level. A priori attitudes and perceptions of stakeholders at 3 levels — VA Central Office (VACO), facility leadership, and individual clinicians — appeared to be important elements of the context in which chiropractic services were conceptualized, planned, and ultimately introduced. At senior VACO levels we found no evidence of support or “champions,” but conversely uncovered initial strong resistance. I don’t know if it was necessarily negative about chiropractors per se, or if it was negative about VA being told by Congress that they had to do something… because a lot of what VA gets is unfunded mandates, of which this chiropractic integration is another. Anyway it was clear that [senior VACO leader x] wasn’t going to be that interested in going forward. (1A10, Federal advisory committee member). I believe that chiropractic care has no scientific basis…[it] is quack medicine. (1A5, neurologist). Here the general perception is that there’s a clash between chiropractors and physical therapists. And not just the therapists here; I think in the PT community in general there’s a turf war between chiropractors and physical therapists. (2A3, physical therapist). The preexisting negative perceptions posed a barrier to chiropractic service implementation, but we also found evidence of positive perceptions and expectations. Across subjects at all levels, a stakeholder’s prior experience with chiropractic services appeared to be the strongest influence on whether perceptions and expectations were positive or negative. When favorable, these individual personal experiences appeared to be more important than published evidence or patient preference in determining a stakeholder’s views of the new program. I was excited [to learn of plans to implement a chiropractic clinic], because I have friends who are chiropractors and I know what they do. (1A7, primary care physician). [My perception] was positive. I’ve always read up on some of the literature that shows chiropractors, as far as treating back pain, are actually better than us in that sense at satisfying patients, so I thought it’d be a good move for Veterans. (3C6, primary care physician). We uncovered wide variation in the overall processes and timelines for developing and introducing these clinics. Several facilities engaged in a robust method including internal planning with hospital committees and/or opinion leaders, establishing a search committee to select the DC clinician, and engaging with off-site (VACO or non-VA) chiropractors to provide subject matter expertise when this was not available onsite. In other instances the entire process was tasked to one individual who received no assistance from other VA or non-VA stakeholders. This was the case at some of the inaugural sites introduced in 2004, whose leaders reported that little guidance was available at the time. Central office provided zero information except for the [chiropractic] Directive. (4T1, Chief of Staff). Among the more recently introduced sites, in contrast, leadership reported being more informed and guided by existing sites and/or VACO. The help that we got from central office was instrumental in…this new endeavor for our medical center. (5T4, administrator, planner). The initial willingness of a facility to embrace and promote the new chiropractor, or suppress and limit that provider’s interactions, was also strikingly variable. Here again, at some inaugural sites there was a perception of greater resistance, whereas the more recently introduced sites reported greater receptiveness. [When] I came here in person…there were about six people [in the room] and one of them was the chief of neurology …and I understand by other people in the room that he was not too happy with a chiropractor coming on board. And the chief of radiology didn’t want me to be able to order any x-rays and I asked my [supervisor] …I said, “I”d like to go down and see that x-ray facility and see what’s this all about.” He said, “I don’t think you should, because you know what, they really don’t care for chiropractors down there, the chief and all.” And so guess what, I’ve been here almost six years, I haven’t visited down there yet. (2A2, inaugural site chiropractor). I was taken around and if a person was present, I would meet them, and over time [there was] opportunity to meet people. I did a Mortality and Morbidity case presentation, so I got to meet quite a few staff at that. (3C2, more recently introduced chiropractor). Our sample of clinics varied in administrative alignment. This seemed to originate from differences in each VA facility’s overall arrangement of clinical services rather than any particular optimal model, and did not appear to relate to clinic function. Resources allotted to the chiropractic clinic (eg, the number of treatment rooms and availability of support staff) also varied, ranging from 1 room with no staff to 4 rooms with a clinical assistant and nursing support. In several instances clinic staffing was scaled upward over time based on increasing clinical workload. The chiropractors themselves were a central element of clinic structure, and we identified differences in chiropractor attributes which seemed to represent barriers to, or facilitators of, successful integration. We found that lack of training or experience in medical systems and/or health care teams were obstacles, whereas high professional competencies and demonstrated collegial interpersonal skills were important to a DC’s perceived acceptance and integration. Non-DC staff reported several factors that they perceived to help or hinder successful clinic implementation. Commonly mentioned were a given chiropractor’s overall social (nonclinical) traits, such as their perceived interpersonal skills, participation in facility activities, and personality in general. … a big amount of success or lack of success was going to be who got picked [for the DC position]. Who was going to be the person …to do the job, because that person would need to know that they were stepping into a multidisciplinary environment…that they were going to work on a referral basis, that they were going to have to face a certain amount of negative and possibly demeaning [criticism] from other clinicians, initially…but with time and perseverance and results, that would all get won over. (1A10, primary care physician/administrator). Our [DC] has been very active in team meetings; he’s been active in collaborations. So I don’t know if that can be generalized, but at least in this situation, he kind of made his own success. (5T2, physiatrist). I think some of his personality has made him a little bit of a more difficult fit with a number of people in the service, and perhaps [others at the facility]. (2C3, chiropractor supervisor). Clinical characteristics reported as beneficial included evidence-based practice, competent training, and appropriate scope of practice. I’ve had about three chiropractors that I truly trust in my career, and [they practice] evidence-based medicine, they have a process improvement approach, and obviously are well-read and do what the scientific evidence indicates. (2C7, primary care physician). [outside of VA] I would occasionally have chiropractors get out of their lane and into my lane and start trying to manage patients’ diabetes or hypertension or coronary disease, as opposed to just staying focused on the mechanical issues of the back. But I have not had any issues along those lines here. (6A2, primary care physician). Clinics demonstrated much similarity in the patient population, musculoskeletal conditions seen, and clinical services delivered. Our study sites were consistent with VA national data describing visit indications. As assessed by primary ICD codes, across VA nationally from 2004 to 2012 approximately 60% of chiropractic visits were for low back conditions, 20% neck conditions, 15% other or nonspecific musculoskeletal conditions, and 5% thoracic conditions. This has changed little over time. As expected, the majority of consultations to our study chiropractic clinics originated in primary care; other referring clinics included physical medicine, orthopedics, neurology, pain management, polytrauma, women’s health, and rheumatology. A general trend of increasing penetration within referring clinics across all sites was seen over time. 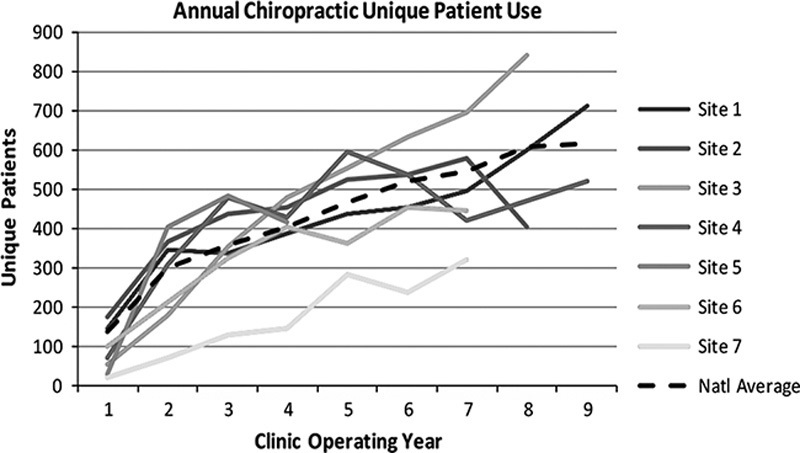 Clinic use generally increased over time (Figure 1). At 5 of the 7 clinics the increased use was relatively consistent and tracked VA national averages; at the remaining 2 clinics the patterns were more erratic and tended to be decreasing in the latest years. At 6 of the 7 clinics, a general trend of increasing penetration of a facility’s overall patient population was seen over time. 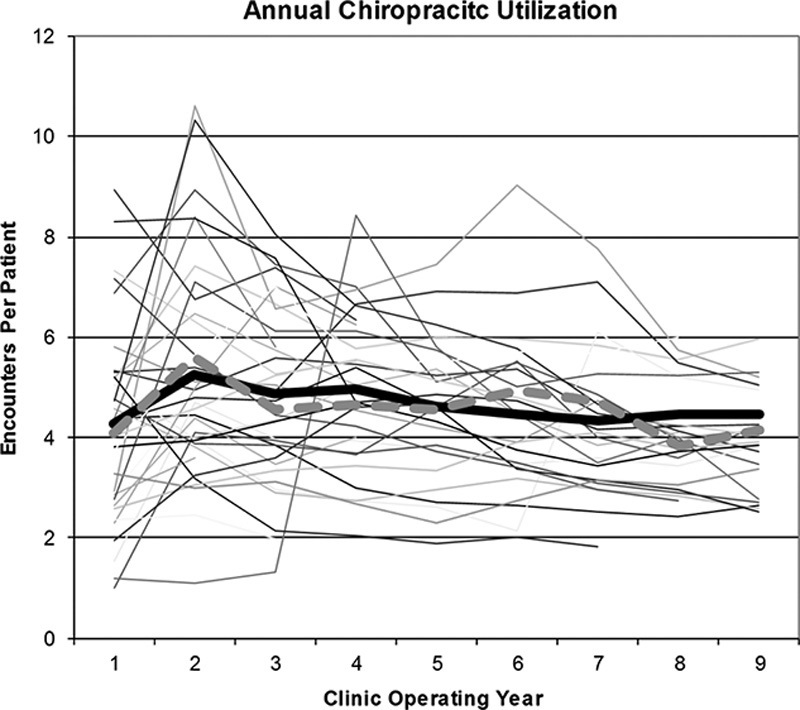 Average utilization across all study sites was consistent with the VA national average of approximately 5 visits per patient per year, (Figure 2) however, wide variation existed between all VA chiropractic clinics. Clinical services provided were estimated by assessing the frequency of current procedural terminology codes assigned to each visit. For illustration, the top 20 current procedural terminology codes nationally for fiscal year 2011 were collapsed into representative categories. Study sites were similar, with the exception that none of our sites reported acupuncture treatments. In general, stakeholder perception of chiropractic clinics was predominantly favorable. Medical physicians tended to view chiropractic services on a continuum; variations in views were associated with whether the physician did or did not refer patients to the chiropractic clinic. Among the nonreferring group, a few physicians were strongly opposed, but most views ranged from minor opposition to reasonable acceptance. Among the referring group, most expressed a range from benign acceptance to appropriate consideration, and some expressed strong satisfaction and perceived value. Across all medical physicians, many expressed a lack of knowledge of evidence-based guidelines for management of mechanical spinal conditions; a lack of knowledge of chiropractic services; and the perception that little/no data support the use chiropractic services. Patients who used the chiropractic clinics reported favorable opinions, but raised concerns about wait times and access. Patients who had not used the clinics expressed a lack of knowledge. Administrators, including chiropractors’ supervisors and senior facility leadership, expressed favorable opinions. All chiropractors reported satisfaction with their work. Two chiropractors expressed dissatisfaction with clinic staffing and resource allocation. After our site visits, 1 chiropractor chose to leave VA for personal reasons, and that clinic was subsequently discontinued. This facility reported its intention to increase use non-VA chiropractic services in place of an on-station clinic, however, we uncovered no evidence of increased non-VA chiropractic care, and patient access at this facility has dropped dramatically. We sought to identify key features of clinic implementation that correlated with selected clinic outcomes in our sample. Although it was beyond the scope of this work to assess cause and effect, we did find certain characteristics tended to align with our composite ratings of clinic implementation success (Table 3). The clearest associations were seen with the facilities’ initial motivation toward clinic introduction (ie, was the facility doing this of its own will or was it being required to do so? ), and with the chiropractors’ level of clinical competence, experience in integrated delivery systems and/or academic settings, and demonstration of collegial team member traits. Although chiropractic services are supported by reasonable evidence and in demand by Veterans and Congress, these services historically have not been part of medical systems. Moreover, it is known that physician opinion of chiropractors varies widely.18 These factors posed barriers to introducing chiropractic services in VA. The initial VA resistance should be understood in the context of the inherent difficulty faced when complying with any nonfunded Congressional mandate, the historical physician opposition to chiropractic services, and early external stakeholders proposing that VA chiropractors should function as primary care providers. (2) the DC being perceived as competent in evidence-based practice and skillful in collegial collaboration. This may have relevance for initiatives to train new DCs to serve in VA and other hospital settings. The overall variation in clinic structures at our sites suggests that chiropractic clinics can be implemented at other VA facilities consistent with their particular needs and resources. The dramatic increase in clinic utilization at our sites and across VA nationally demonstrates that when these services are made available, there is strong uptake of services among referring physicians and patients. The erratic use and utilization patterns seen at some sites may be part of a natural progression of adding a new clinic service, or may reflect the lack of valid models for optimal population penetration of services, case management/utilization strategies, and chiropractor staffing resources. Two clinics addressed increasing use by adding staffing capacity, whereas 2 others put limits on clinic access by refusing new consultations for periods of time to reduce backlog, and one of these restricted care to acute cases only, with a maximum of 3 visits. While the introduction of on-station chiropractic clinics in VA was nationally mandated, key characteristics of the planning, implementation, function, and ultimate impacts of the clinics we studied appeared to be largely determined by local factors. The clinics varied in features such as administrative alignment, chiropractor integration, and degree of team-based care. The clinics were similar with respect to types of patients seen, clinical services delivered, and dramatic increase in use over time. The delivery of chiropractic services at 1 study site was discontinued, whereas the other 6 study sites are well functioning. The overall implementation at these 6 sites suggests that chiropractic clinics can be sustainable and replicated at other VA facilities consistent with local needs and resources. The authors would like to acknowledge Angela B. Cohen, Deborah Delevan, Courtney Armstrong, Joan A. Walter, J.D., P.A., and Rick Welton, M.D., for their support and contributions to the project. They would also like to acknowledge the members of the project advisory board: Lucille Beck, Ph.D.; Charles Burgar, M.D. ; A. Lucile Burgo-Black, M.D. ; Ian Coulter, Ph.D.; Paul Shekelle, M.D., Ph.D.; Joan Walter, J.D., P.A. Soklaridis S, Kelner M, Love RL, et al..
White MR, Jacobson IG, Smith B, et al..
in a large military cohort. Dunn AS, Green BN, Gilford S.
Green BN, Johnson CD, Lisi AJ, Tucker J. Integration of chiropractic in the Armed Forces health care system. Breuer B, Cruciani R, Portenoy RK. and acupuncturists: a national survey. Shekelle PG, Hurwitz EL, Coulter I, et al..
J Manipulative Physiol Ther. 1995;18:265–270. Second Session. October 3, 2000.
section 204, Program for Provision of Chiropractic Care and Services to Veterans. 2012. Chiropractic Care: Directive 2004-035. 2004. Case Study Research: Design and Methods (Volume 5). 2009. Khorsan R, Cohen AB, Lisi AJ, et al..
Busse JW, Jacobs C, Ngo T, et al..
Attitudes toward chiropractic: a survey of North American orthopedic surgeons. Spine (Phila Pa 1976). 2009;34:2818–2825.